I’m pretentious (or maybe just stoopid) to write “geology” instead of “rock” or engagement ring. 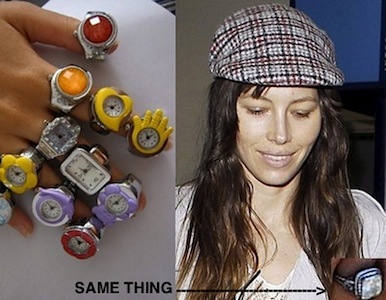 I only wanted to talk about how Jessica Biel’s ring from Justin Timberlake looks like costume jewelry. OR a ringwatch? Or Green Lantern’s source of power. In case you forgot, JT and JB began dating in January 2007, broke up in March 2011 then got back together just four months later, in July. And I say it as a tiny fairy, Julia Roberts in fact, in Hook – looking at it as something to jump through.